They’re finally here, the long awaited, and forever unreleased, IRS and Job Manager are finally released. Few clicks and the game is easier, or is it? Let’s find out! Follow us right after the jump for the walkthrough! The questline auto starts once you reach Level 35 and involves Homer and Agent Johnson, the latter of which unfortunatly wasn’t released. The best part of rebuilding Springfield is that it makes me proud of my accomplishments. On second thought, the best part of rebuilding Springfield is all the money I’m collecting. System Message: Complete this quest chain to unlock the IRS. 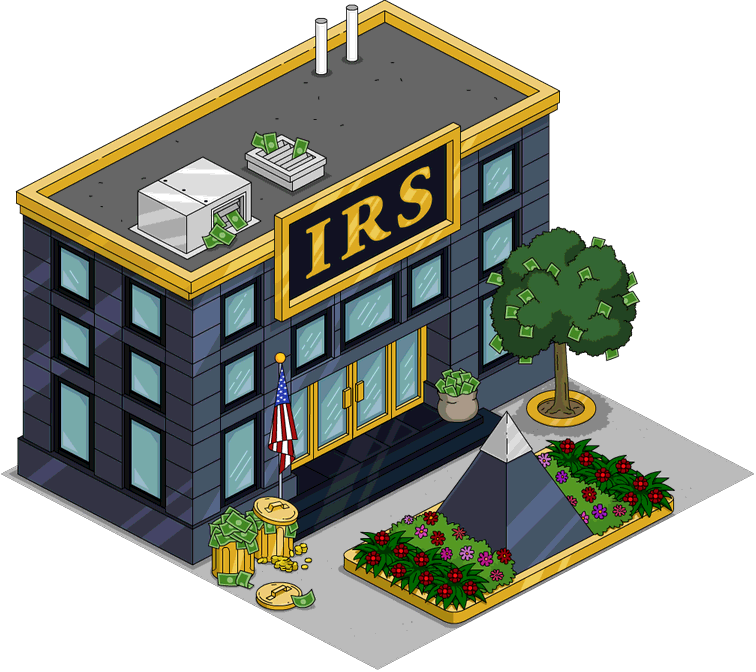 Use the IRS building to collect income easier! Earning money is a lot harder now that Springfield is so big, and everything is so expensive! It’s called inflation. The more money you create out of thin air, the more expensive things will get. Okay, okay. Maybe I have SOME money. Is that such a crime? Actually, Mr. Simpson. Not paying taxes on your income is a very serious crime. I’m Agent Johnson of the IRS, and you’re going to tell me who else in town has been evading their taxes. Look, I get it. You’re playing good cop, bad cop. I’d like to speak to the good cop, please. That’s cute. I am the good cop. So what you’re saying is that everyone in Springfield hasn’t paid any taxes since the town was destroyed? Even for a member of the IRS that’s too much paperwork. I suppose since nobody can even tell me what state we’re in I have no choice but to let it slide. So, Agent Johnson. What are you going to do now that the IRS is letting everyone in town evade their taxes? Our branch has to do something, and collecting money is all we know. Isn’t there any use for that in this town? System Message: Collect your income faster with the IRS – available in the store now! We’ve started with the base service, which is free of charge. Yeah, free, right. I know how things work in this game. Come on, it’s free! Give it a try. It will allow you to collect your income in a more efficient, a.k.a. lazier way. System Message: Tap on buildings and characters to collect in a radius around them. Upgrade the IRS to increase the area! You really did make it easier. Now I can collect taxes while sitting on my couch with a beer in one hand, a sandwich in the other, another beer balanced on my belly, and in this cup holder… a second sandwich. I’m afraid to ask what you used to collect taxes with. Years of working at the power plant has left me with a pretty useful vestigial tail. And a pretty useless case of irreversible radiation poisoning. So… can you make that circle thing even bigger so I can collect more money, in less time? Of course! You just need to upgrade to our Deluxe or Mega-Lazy service. Every time you do we’ll make it even easier for you to collect your income. So to do less work collecting money, I need to earn a bunch of money first by working? Exactly. Let me give you a little lesson in economics. 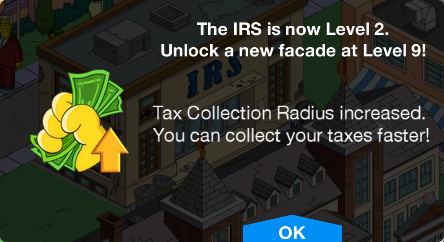 System Message: Upgrade the IRS to increase the Tax Collection Radius and save yourself more tapping! This is where all my taxes go? To build the IRS a nicer building? I wanted it to go to increased military spending. ID and social security number please. I’ve actually got both, now that the criminal who stole my identity gave them back. Oh! Mr. Van Houten. You can just skip the line thanks to your frequent visitor status. That’s ok. When you’ve got nothing but time on your hands, waiting in line is like a vacation with purpose. That’s the saddest thing I’ve ever heard and I work at the unemployment office. And moonlight at the suicide hotline. You do? Tell Gary I said hello! And I’ll be speaking with him soon! Right now I was kind of just hoping for a hug. If he isn’t taking it, I’ll take that virtual gold farmer job. Maybe then ol’ Gil’s virtual wife will stay faithful. I’ll take the roadkill cleaning job. After working at Krusty Burger, it’ll be nice to see where our meat comes from. Wow, I didn’t realize that I wasn’t the only unemployed loser out there. 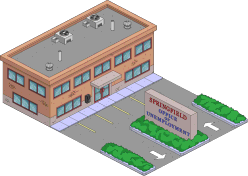 Why is all of Springfield looking for a job? Some people are just too lazy to tap a few buttons. Not me — I trained a monkey to push buttons for me! System Message: Tap the Office of Unemployment to access the shiny new Job Manager. 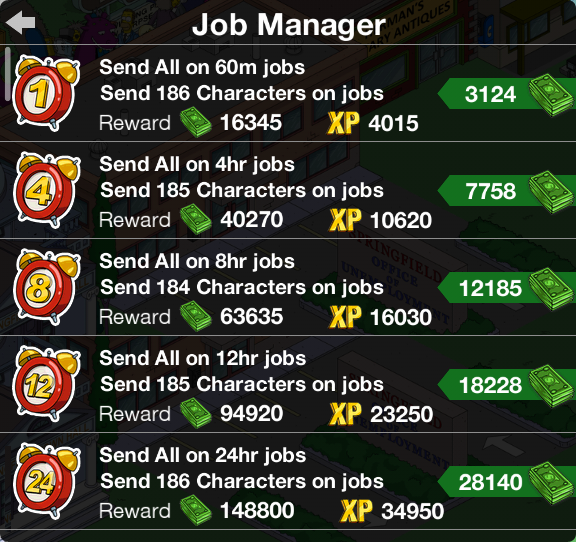 Use the Send All button to send all the available characters on jobs! I’m used to paying for a lot of things: hair plugs, girdles for men, my child’s love. But did I just pay to go on a job? Sending someone on a job means a lot of paperwork, which we pay people to do, but then there’s paperwork for hiring them, and you see how this goes. So we deduct a portion of your income to pay for our administrative fees. It doesn’t cost you anything…except for money. I’ve lost my IRS building. I stored my town & it disappeared. Can I get it back? Is anyone else having trouble connecting and getting the message sorry EA network can’t be reached at this time? Why does the job manager send less than half of my characters on tasks? Most of the ones left over are not used in the monorail stuff or Springfield Heights. It’s inexplicable why they would do this and makes the feature pretty useless. Am I doing something wrong or is this just the way it is? do you have quests in progress? Just money mountain and sometimes one other. Characters like O’Flanagan and Princess Penelope are never used for quests and they aren’t sent so that doesn’t explain it. Do all of your characters get sent or is mine not working? Any upcoming spoilers in the files? I’m rebuilding from a nuke… At about 65%-70% completion and want to make sure I have enough room in particular areas of town. Any info will gladly help. Also, do you know when we will get more water? …or land? Man, it IS getting to be that time again, isn’t it?! Can’t wait to see what they’ve got for us this year. What about the IRS drone? When will it be available? Is there a maximum amount of in game cash that you can have? Thanks. When you have been playing since the beginning, in game cash is not a problem. Having ways to spend it, that’s the problem. Anyone else finding that the Job Manager is not actually sending all available characters on their assigned “n – hour” jobs? Meaning, after being sent, you can still see quite a few characters walking around doing nothing and when clicked on, their selected 1 or 4 hour jobs that were selected in the JM are available and they aren’t doing it. Hope that makes sense. I found out that characters who still have quests to finish are not sent. I am lvl 58, I have no unfinished quests. These are some of the lower-level characters in addition to higher profile characters. This is what I don’t understand. Sure, Frankie and those guys I have doing their aactivities through the…crap…whatever it is called with the side-bar action and “!” action, but the rest are “old” characters. This is what I don’t understand. 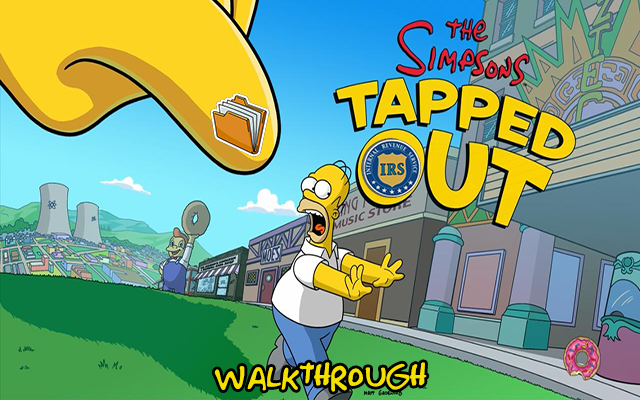 I can send “n – #” of characters on an “n – hour” task through the JM, and I will still have Lisa, Bart, Moe, Quimby or whomever…plus a dozen or two more just walking around twiddling their thumbs doing nothing! You can click on that character, and what ever JM hour job you selected “for everyone”, theirs is open! The JM never sent them on it! So they are just walking around doing nothing. So, did I pay them to do nothing? Or is the JM not recognizing and sending them off to do their job? I don’t know what is going on. Yes that’s happening to me too. Yeah, it would be nice if someone responded to that actual anomaly…right…??? Happening to me too. In all 3 of my towns. 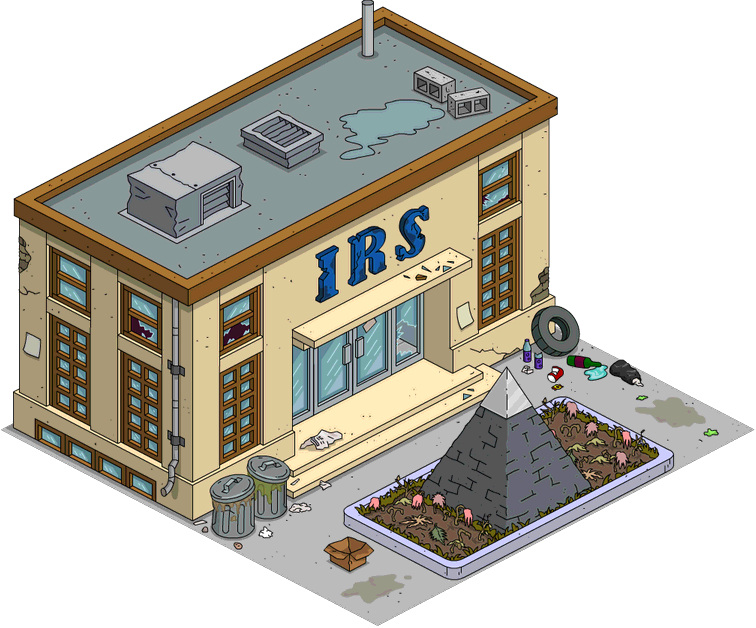 The first upgrade to IRS Building cost is 50000 but additional levels are much more expensive. I am at level 4 and to upgrade to 5 the cost is 1000000. A bit expensive don’t you think. Do you find out what the cost is for 6 through 9. 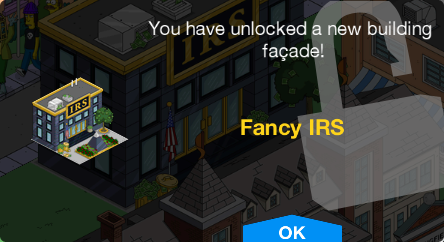 It costs 20 million at lvl58 to upgrade irs to fancy irs building. Shockingly expensive. It looks like you get a lot less money using the job manager so I wont use it. Yeah thats the downside to one click for all or else they’d have left it as it was. Next Last hours for Statue of Burns and starting the Every Man’s Dream Tie-In questline!